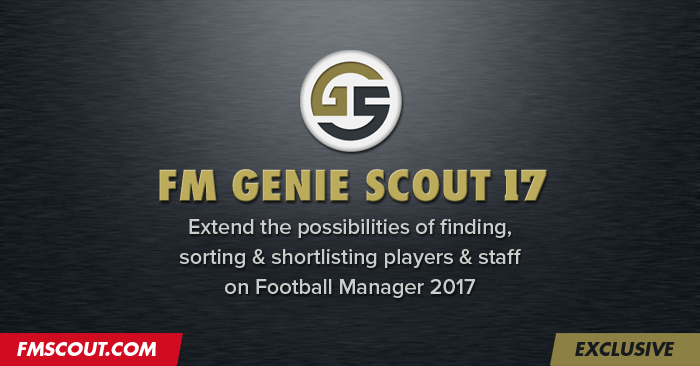 Welcome to the official download page of FM Genie Scout 17, the best real-time scout tool for Football Manager 2017. Exclusively available from fmscout.com since 2009. Genie Scout 17 "g" edition now free! As of October 18th, the special "g" edition of Genie Scout is available for free! Normally this edition requires a license and is only given to Eugene's direct supporters who donate to keep the development of this brilliant tool alive. Genie Scout 17g has no ads and includes a couple of extra features, such as search by role rating and probability of development. We don't allow sharing Genie Scout 17 directly on other sites. Please point the download link to this very page. You cannot host any files yourself. Run Football Manager 2017 and load your saved game. Launch Genie Scout 17 and from main menu click "Load Game". The "g" edition has no ads and includes a couple of minor extra features. Update: As of October 18th, the "g" edition of GS for FM17 is made public and doesn't require a license! Refer to Genie Scout 17g FAQ if you have further questions. Eugene has automatized the process of distribution for the "g" edition, so you will have to wait just a few minutes before you receive a download link and a key file. But only if they have sent correct contact email, correct Unique ID alongside your donation. FM Scout (the site) is not involved in the donations towards Eugene, neither has any responsibility delivering the ad-free version to you after donation. This is a process handled solely by Eugene himself. Genie Scout 17 is created by Eugene Tarabanovsky. He has been developing this amazing scout utility for the past 11 years! 182 comments have been posted so far. why cant i edit ratings in fmgs 17 g free edition???? Hi, trying to redownload GS and the download link on this page takes me to a 404 instead. Hello, when i am trying to load the fm to GS i says the fm is not found and that i need to get fm 17.01 and higher why??? hi I can't download using the link. is someone able to send genie scout to me in private message? Hi, when trying to export a .csv (after changing the visible columns and moving the order around), I get the error "List index out of bounds (-2)". What does this mean/how can I fix it? GS dow not show the correct attributes does not work as intended for me anymore. It shows all wrong numbers, and when ticking "Show Potential Attributes" CA goes to 0, and the attributes goes to even worse. This is happening with all players, PA/CA does not matter. Anyone seen this before? How can i fix this? "windows cannot access the specified device, path or file. You may not have the appropriate permissions to access the item"
My user is running as administrator and i've disabled my norton anti virus. Yep, just to confirm AVG Labs confirmed the file is clean. Download away and whitelist if necessary. My virusscanner also gave me a message but I just allowed the file. I trust genie. The in-game updater tells me 16.3.2 is the latest edition, and so have tried to download from Scout. AVG has alerted me to potential issues with the files. I've "whitelisted" both the installation file for 17.3.2 update and the executable file itself and AVG is throwing a hissy fit, and has sent it to Labs for analysis. When I try to run the program my avast block it...It says that the program has a FileRepMalware. Ignorant question i see now. I had been deleting and reinstalling genie yesterday to see if i could get it to work and didnt think to go check the update option in genie itself. I just received the email from Eugene. Great service as always! Close your GS17g and reopen it. Should tell you there's a new version. Then from main menu (big GS circle top left) go to Help & Support > Check for New Version. You'll find download link there. Hey stam, thanks for that update and its great news. From here I can only download the public version which doesnt use my key file. Could you tell me where to download the g edition? New GS17 version that supports yesterday's 17.3.2 patch is now available for both public and g editions. when will eugene release new genie scout? We need it!!!!! We are aware of the new 17.3.2 patch since its release. Eugene is working on the update, which should be ready by tomorrow. I have the G Edition. How long until it works with the new football manager patch? Handcrafted in Symi, Hellas. Page created in 0.672 seconds.